Cho U is the star of this report. Not only did he defend his Meijin title, he followed that up by winning three title-match games in the six days from Monday, 10 November, to Saturday, 15 November. We don't know if there's a precedent for this, but it certainly testifies to his increasing dominance in the tournament scene in Japan recently. Details of the games, in the Oza, Tengen and Agon Kiriyama titles, can be found below. After Cho U had recovered from his 0-2 start by winning three games in a row, Iyama Yuta blocked his seemingly unstoppable path to victory with a good win in the sixth game. It was played at the Oni no Sumika (Devil's Dwelling Place) inn in Shuzenji, Izu City, Shizuoka Prefecture on 30 and 31 October. Iyama showed no signs of the pressure of being on a kadoban (a game that could lose a series). The game started peacefully, but a fierce fight broke out when Cho, playing white, made an invasion. His forte is invading just before the opponent finishes securing his defences. In contrast, Iyama plays thickly, waits for the opponent to attack, then tries to take the initiative with his counterattack. In this case, the counterattack went well for Black, as he had only one weak group to look after, whereas White had two. Iyama took the initiative in this fight and the game became one-sided. Cho resigned after 99 moves, making this the third-shortest game in the Asahi-sponsored Meijin tournament. At this point, the chances of a teenaged Meijin looked good. The deciding game was played at the Tokiwa Hotel in Kofu City, Yamanashi Prefecture on 5 and 6 November. Iyama drew black in the nigiri. He was unable to make good the advantage of the first move, however, as Cho U had completely recovered from his one-sided loss in the sixth game and was in brilliant form. He secured the advantage in the first major fight, making sure that White did not fall behind on territory. An early turning point came when Iyama made a peep that Cho contrived to turn into a gote move. More spectacularly, a difficult capturing race started with move 116, but Cho read it out perfectly; he set up a ko, captured a black group as compensation and secured the lead. Iyama fought on tenaciously, but was unable to stage an upset. Although he fell short in the end, there's no doubt that Iyama did well in his first best-of-seven title match. Making Cho U go the full distance is an achievement in itself (only ten of the 47 Yomiuri and Asahi Meijin title matches have gone to the 7th game). Go reporters were impressed by his self-possession and the way he maintained the same demeanour whether he won or loss. It also came out in interviews that he had no trouble sleeping during the match. Many players have found this their biggest problem during two-day games, including even self-confident players like Yoda Norimoto. Results: Game 6 (30, 31 October). Iyama (W) won by resignation. Game 7 (5, 6 November). Cho (W) by resignation. The play-off to decide the challenger to Yamashita Keigo for the 33rd Kisei title was held at the Nihon Ki-in on 23 October. Yoda Norimoto 9-dan, the winner of the B League, defeated Iyama Yuta 8-dan and so will make his second challenge for the Kisei title (the first was in 1998, when he lost to Cho Chikun 2-4). Taking black, Yoda won by resignation. The first game of the title match will be played in Sapporo on 14 and 15 January 2009. The first game of the 58th Oza title match was played at the Yokohama Royal Park Hotel in Yokohama City on Monday, 27 October. Cho U Meijin is challenging Yamashita Keigo Kisei. In previous encounters between these two, Cho has a big lead of 25 wins to 15 losses. In a fierce game marked by continuous running fights, Cho (playing black) showed formidable fight skills, forcing Yamashita to resign after 191 moves. The second game was played at the Hotel Okura Kobe in Kobe City on 13 November. Playing black, Yamashita did his best to even the series, but he made a fatal error and had to resignaiton after 148 moves. Cho's chances of taking this title now look pretty good. Our headline for this item has the same wording as the previous one, for a good reason: Cho U is duplicating his good start there. Making his first challenge for the Tengen title, he has taken the first step towards adding a new title to his collection by winning the first game with the titleholder, Kono Rin. The game was played at the Yumoto Sakakibara Inn in Tsu City, Mie Prefecture on 13 November. Taking white, Cho won by resignation after 170 moves. In September, Kono had scored his first win against Cho U after seven successive losses when he beat him in the final of the Ryusei title. Shortly before the first Tengen game, on 8 November, he also beat him, by half a point, in the semifinal of the 4th Daiwa Securities Net Go tournament. These two wins had improved his score against Cho to 4-11 and had seemed to be a good omen for the Tengen match. However, Cho seems to have the upper hand again. The second Tengen game will be played on 20 November. The final of this tournament was held in Kyoto on 15 November. Cho U defeated Takanashi Seiken 8-dan, who was appearing in his first tournament final, by resignation. This was the third of the three title-match wins by Cho referred to in our introduction. It is Cho's 25th title, which puts him in 8th place in the all-time list. Cho has now won the Agon Kiriyama Cup three times in a row, but he suffered two successive losses to Liu Xing in the Japan-China play-off. This time he will be facing Gu Li. After losing the first game of the 27th Women's Honinbo title match, Xie Yimin recovered to win three games in a row and defend her title. In our previous report, we gave the results of the first two games. The third game was held at the Nihon Ki-in in Tokyo on 29 October. After a game in which fortunes fluctuated, Xie played a clever move that secured her a victory by 1.5 points with black. The fourth game was also played at the Nihon Ki-in, on 5 November. Xie (white) played the powerful attacking game she is known for, but Suzuki Ayumi 4-dan resisted strongly. The game went to 309 moves, and Xie managed to secure a win by half a point. She thus completed her first defence of her title. Full results: Game 1 (1 October). Suzuki (W) by resignation. Game 2 (8 October). Xie (W) by resignation. Game 3 (29 October). Xie (B) won by 1.5 points. Game 4 (5 November). Xie (W) by half a point. Four games have been played in the 64th Honinbo League since our last report. Playing on a Monday (23 October) because of his ultra-busy schedule, Cho U Meijin (W) beat Kataoka Satoshi 9-dan by 1.5 points. On 30 October, Yamada Kimio 9-dan (B) beat So Yokoku 8-dan by resignation. On 13 November, Kataoka Satoshi 9-dan (W) beat Yoda Norimoto 9-dan by resignation and Yamada Kimio 9-dan (W) beat Nakaonoda Tomomi 9-dan, also by resignation. The second of the vacant seats in the 34th Meijin League was decided on 30 October, when O Meien 9-dan (B) beat Yamada Noriyoshi 9-dan by 7.5 points. O will be playing in his tenth Meijin league. The third vacancy was filled on 6 November, when Cho Riyu 7-dan (B) beat Hane Naoki Honinbo by resignation. This result was a bit of a surprise, as Hane, who had only appeared in the 25th and 26th Meijin Leagues, was the favourite. However, the little-known Cho triumphed in a slow but fiercely contested game. In the morning session, only 15 moves where played, and that had increased to only 432 moves by the dinner break. This was a much slower pace than the first day of the final game of the Meijin title match, being played at the same time. The game was decided by a life-and-death oversight by Hane. At first, his opponent didn't see either that a large white group could be killed. The killing move was a tesuji seen in classic life-and-death works. Cho reports that when he realized, he started trembling. The position is shown in Diagram 1. Hane assumed that he had two eyes in gote or one eye in sente on the right side, so he played 1 and 3. These moves don't make an eye, but they can with one more move and, even if Black preempts that eye, White gains by having played them. However, Hane overlooked Black 4, which reduces his eyes on the side to zero. Please check for yourself that whatever White plays on the side, he can't get an eye there. At the bottom, it may look as if White has an eye in gote, but that's not so. If Hane had played 1 at 'a', he would have secured two eyes in gote. The game would then have been decided by whether Black could do anything with his 'trapped' stone on the left top. The odds of success are 50-50. If Black attaches at 1 in Diagram 2, White 2 is the only move. If Black 3 White can capture two stones with 4 and 6, but the group is cut in half by Black 7, so both sides die. Pulling out his stone with 1 in Dia. 3 doesn't work for White. If he hanes at 5, Black seals him in with 6. Cho Riyu is a Taiwanese player born in 1981. He is a disciple of O Rissei 9-dan. Entering the Meijin League is the first major achievement of his career. As previously reported, the first vacant seat was taken by Ogata Masaki 9-dan. In the final of the Winners' Section of the 47th Judan tournament, held on 23 October, Cho U Meijin (W) defeated Cho Chikun, 25th Honinbo, by 5.5 points. This win secures Cho U a place in the play-off to decide the challenger to Takao Shinji Judan. Cho Chikun moves sideways to the semifinal of the Losers' Section, where he will meet Ko Iso 7-dan. The winner of the final in this section will meet Cho U in the play-off. The winner of the Winners' Section is the only player who doesn't get a second chance. This play-off will be held early in the new year. With most of the players having completed four rounds, Kato Keiko, Strongest Woman Player and Chinen Kaori, both on 3-1, share the lead in the first-ever league in a woman's tournament in Japan. Kato has an advantage because of her higher ranking, but in any case the two are slated to meet in the final round in January. Suzuki Ayumi also has only one loss, though she has played only three games, so she could also come into the picture. (6 November) Chinen Kaori 4-dan (W) beat Umezawa Yukari, Women's Kisei, by 4.5 points. Mukai Chiaki 2-dan (W) beat Kobayashi Izumi 6-dan by resignation. The best-of-three semifinals of the Ing Cup, which is staged in the year of the Olympics, were played in Bangkok in late September. Yi Ch'ang-ho and Ch'oe Ch'eol-han both won two straight, so the final will be an all-Korean affair. Yi will be bidding for his second Ing title and Ch'oe for his second international title. Game 1 (23 Sept.). Yi Ch'ang-ho 9-dan (W) d. Yi Se-tol 9-dan by resig. Ch'oe 9-dan (W) d. Liu Xing 7-dan (China) by resig. Game 2 (25 Sept.). Yi Ch'ang-ho (B) d. Yi Se-tol by resig. Ch'oe (B) d. Liu by resig. Tuo Jiaxi 3-dan, a 20-year-old, as made a great start for China in the 10th Nong Shim Spicy Noodles Cup by winning all four games in the opening round, which was held in Beijing. China clearly has a great chance of repeating its success in the previous cup. defeated Heo Yong-ho 6-dan (Korea) by resig. Game 2 (22 October). Tuo (B) d. Yamashita Keigo 9-dan (Japan) by 4.5 points. Game 3 (23 October). Tuo (W) d. Yun Chun-sang 7-dan (Korea) by 3.5 points. Game 4 (24 October). Tuo (B) d. Kono Rin 9-dan (Japan) by 4.5 points. History quickly repeated itself in the 7th Cheongkwanjang Cup, the female version of the Nong Shim Cup, with another lead-off Chinese player winning all four games in the opening round. Here it was Song Ronghui 1-dan, aged just 16, who had covered herself in glory by taking the gold medal in the women's individual championship at the World Mind Sports Games. The results in these two team tournaments make one wonder if Chinese go might not be entering a golden age. Game 1 (12 Nov.). Song Ronghui 1-dan (China) (B) d. Yi Ta-hye 3-dan (Korea) by 5.5. Game 2 (13 Nov.). Song (W) d. Kato Keiko 6-dan (Japan) by resig. Game 3 (14 Nov.). Song (B) d. Yi Ha-chin 3-dan (Korea) by 5.5. Game 4 (15 Nov.). Song (W) d. Mannami Kana 4-dan (Japan) by resig. The quarterfinals and semifinals of the 13th LG Cup were held at the beginning of November. on the island resort of Cheju off the southern coast of Korea. Japan had done quite well in this tournament, with two players reaching the best eight, but they were both eliminated. The final will be a clash between the players who, judging by recent form, look like the world's top two, Gu Li of China and Yi Se-tol of Korea. In particular, Gu Li has been doing well this year, winning the Fujitsu Cup and reaching the finals of the 13th Samsung Cup and the 4th Toyota & Denso Cup and the quarterfinals of the 7th Chunlan Cup. Yi Ch'ang-ho 9-dan (Korea) (B) defeated Yamashita Keigo 9-dan (Japan) by 4.5 points. Yi Se-tol 9-dan (Korea) (W) d. Kono Rin 9-dan (Japan) by resig. Pak Yeong-hun 9-dan (Korea) (B) d. Chang Hao 9-dan (China) by resig. 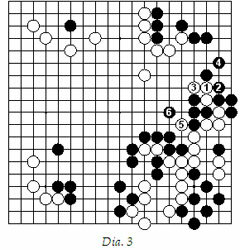 Gu Li 9-dan (China) (B) d. Kim Hyeong-u 4-dan (Korea) by resig. Gu (W) d. Yi CH by 1.5. Yi ST (B) d. Pak by resig.